For the last three months in a tucked-away lab in cell 11, high-precision tests have been conducted on the first prototype quadrupole for the new machine. Designed in-house by Gael Le Bec, the 955kg iron quadrupole is much stronger than the current ones, with a slope (or gradient) in its magnetic field reaching 90 T /m – five times higher than at present. This means it can go from 0 to 0.9 Tesla – 18,000 times the Earth’s magnetic field – in just 1cm! It will also use much less energy than the present quadrupoles due to a clever and more optimised design. A quadrupole is made up of four magnetic poles arranged around a central aperture and works as a ‘lens’ for electrons. Its task is to use the magnetic fields of each set of poles to focus the electrons horizontally and vertically and keep them densely packed together as they pass through the magnet. Focusing quadrupoles (QFs) focus in the horizontal plane, while defocusing quadrupoles (QDs) focus in the vertical plane. The QFs and QDs are placed alternately over a cell to focus each plane in turn to keep the electron path densely packed. The apertures are key – the smaller the aperture, the greater the gradient and focusing power of the magnet. The electrons will pass through two ‘families’ of quadrupoles: firstly through the large-aperture, moderate-gradient quadrupoles, then through the small-aperture, high-gradient quadrupoles. This will help produce a highly concentrated electron beam, and consequently, a more brilliant photon beam. 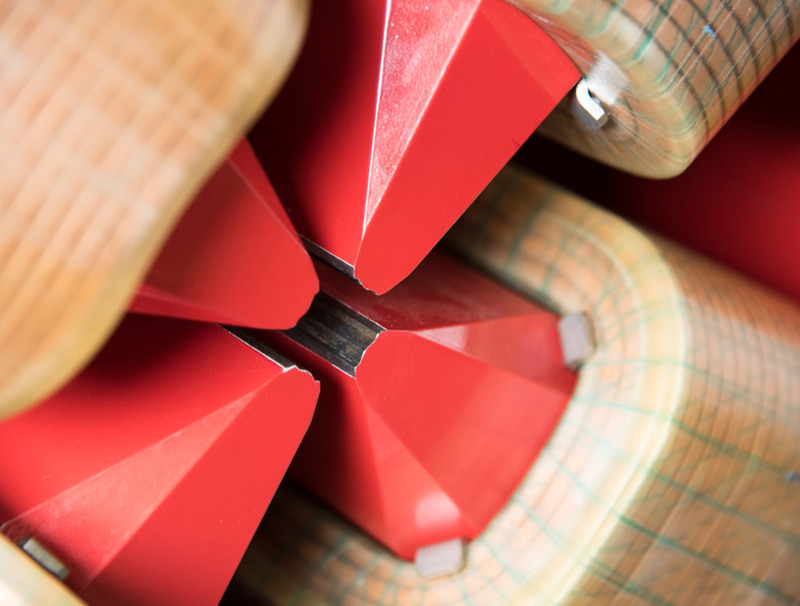 Gael’s tests have concentrated on measuring the centre and defining the axis of the aperture by moving a 100-micron titanium wire running through the aperture and analysing its position and induced voltage. This will make sure the magnets are correctly aligned, which prevents the electrons from being kicked wrongly by the magnets. He also checks the quality of the magnetic field and its gradient strength, as imperfections can be down to construction errors.“The results of these tests have been as expected, with not many surprises,” he reports. The mechanical tolerances will be relaxed for the serial production, at +/- 40 microns – the equivalent of the width of a humain hair – for the assembled magnet. Following the successful results on the prototype, a call for tender is being prepared for producing the final magnets for the storage ring. As each cell in the ring will contain four girders, and each girder will support 3-5 quadrupoles, a total of 512 quadrupoles will need to be produced!